Every framework and tool available for supporting strategic technology and innovation management has strengths and weaknesses, typically associated with what is explicitly included in the tool architecture / format, and what is not. All tools represent simplifications of reality, highlighting certain aspects over others. Naïve use of tools focuses only on the explicit, forgetting the implicit. For example, the well-known SWOT approach (strengths, weaknesses, opportunities and threats) is often used simply to capture these factors in a 2x2 table, which is useful but quite limiting as a strategic approach. For example, where is 'time' in SWOT, which is a fundamental dimension of strategy as a dynamic process? When considered in conjunction with the structured 'canvas' provided by roadmaps, the context and time dimension for SWOT become clear. Given the holistic, flexible and systems nature of roadmap architectures, there is no inherent reason why any other relevant tool cannot be integrated with or in roadmaps, as illustrated below for some related methods. No other tool has been identified that shares the integrative capabilities that roadmapping provides, which can address the very common problem of conflicting and poorly integrated strategy and innovation management tools. The simplest toolkit configuration is to use roadmapping as an integrating knowledge 'hub', although other arrangements are possible. With each tool in the set aligned to the roadmap architecture the set can scale along with the roadmap, to ensure consistency of focus, scope, granularity and aggregation. Over the past 50 years strategy and innovation management tools and frameworks have proliferated, mostly developed by consultants and academics. The choice can be bewildering for managers confronted with a practical challenge. The 2013 book 'Key strategy tools: the 80+ tools for every manager to build a winning strategy' is indicative of this challenge. Although a useful catalogue, it is difficult to judge which particular tools in what combination to select, and how they can be customised to work together to address the issues at hand. And this is just the tip of the iceberg - a study in 2000 (Phaal et al.) identified more than 850 matrix tools (e.g. classic 2x2 type), with dozens more being developed each year, adding to the challenge. Three well-proven tools form the basis of a scalable toolkit platform for strategy and innovation management. These methods have proven themselves in industry for 30-60 years, propagating through a process of speciation. Consolidation to their generic forms as a toolkit platform provides a feasible solution to the proliferation challenge. So, rather than 80 or more tools to deal with, only 3 are required as a starting point, as the basis for a toolkit platform, with a modular approach enabling other tools to be incorporated as required. The challenge is that the generic forms of these tools are quite abstract and they must be combined and configured to purpose, which requires some experience to do reliably with confidence. The good news is that it's possible to 'test-drive' new tools rapidly, with the first iterations useful to assess utility of the methods, and how they need to be adapted to fit the context. For the first pilot, Tom Kappel, who worked with Richard Albright to implement roadmapping in Lucent Technologies in the late 1990s, recommended that a safe environment be chosen to pilot the approach: "it's like carpet cleaner - test it under the sofa, not in the middle of the living room" - roadmapping workshops can be high profile affairs, with failure not an option. 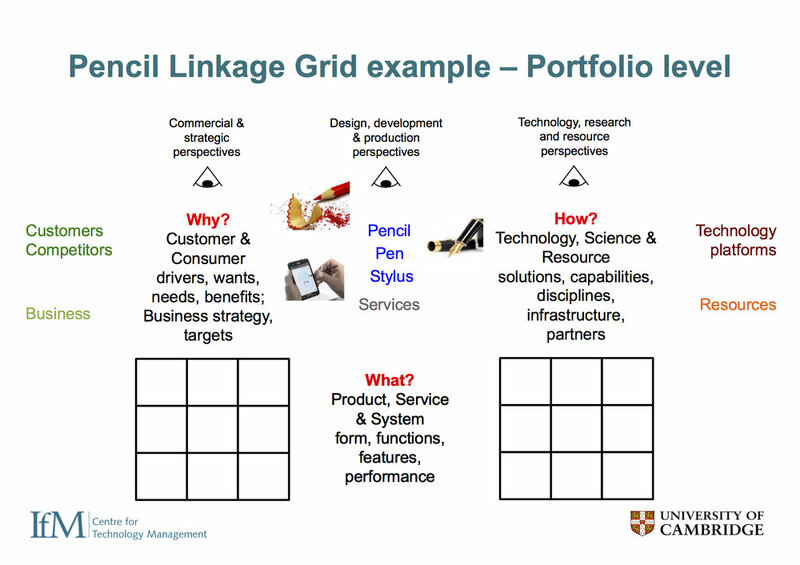 The linked grid is a widely used but generally unrecognised class of tool. The key reference point (instance) is quality function deployment (QFD), a Japanese quality method, linking customer to technical attributes for product design. QFD has been extended in various ways, and a related approach that emerged later is the Hoshin Kanri 'X-matrix' that supports vertical and horizontal alignment of strategy and purpose in large organisations (not widely deployed outside of Japan, although there have been some notable attempts). The design structure matrix (DSM) is another notable instance of this class of tool, as is the cause and effect matrix from lean / six-sigma (related to Ishikawa diagrams). The example that can be most readily related to roadmapping is shown below, from PA Consulting, which links technologies to products and markets - 'technology push' (and vice versa - 'market pull'), matching the three broad 'why, what and how' layers of roadmaps. Time is not an explicit dimension for linked grids, so this one is extended to include (future) potential technologies, products and markets. This simple tool is very powerful and flexible, with strong analytical capability (e.g. spreadsheets), can blend quantitative and qualitative information, and is very useful for mapping and analysing relationships - e.g. synergies. However, the structure and format can be a bit daunting for large systems, particularly if used as a primary lens (e.g. as a workshop template). One of the most interesting examples of this class of tool is shown below, from Gideon de Wet, as a practice-oriented contribution to the 1996 IAMOT conference and not widely disseminated (similarly his interesting 'space map' approach for technology management and audits). De Wet demonstrates the flexibility of the tool, which is very extensible. With the core linking grids 'welded' to the roadmap architecture, as illustrated above, combined with the flexibility and extensibility of the linking grids, ensures that the methods work and scale together. Roadmaps are rather weak with regard to analysis capability, and linking grids are weak with regard to time and narrative. so the two complement each other well. The well-known 2x2 matrix diagram or 'bubble chart' is widely associated with portfolio management, although there are many such matrices in the literature, of varying provenance, prevalence, utility and quality. Six noteworthy examples are shown below. The original Boston Consulting Group product portfolio (market growth vs share) emerged in the early 1970s, preceded by the Ansoff 2x2 matrix in the late 1950s (current/new products vs markets). In response to the proliferation of strategy tools since the 1960s, in 2015 the Boston Consulting Group proposed a new matrix that positions tools in terms of three dimensions: predictability (is it forecastable? ), malleability (can it be shaped?) and harshness (is it survivable?). This defines five distinct strategy environments: classical (predicable, but not changeable), adaptive (unpredictable, but not changeable), visionary (predictable and changeable), shaping (unpredictable but changeable) and renewal (resource constrained). This is a useful contribution, although the manager is still left with many tools and frameworks to consider in each category, with blended options possible. A tools-oriented perspective provides a possible solution, in terms of the scalable toolkit platform to build on that can apply to all strategy environments identified by BCG. Examination of about 40 business, product and technology portfolio selection tools revealed that 60% of these collapse into one generic matrix form comprising two orthogonal dimensions: Opportunity x Feasibility - see below. Opportunity represents the value, impact or other measure of worth ('how big is the pie? '), whilst Feasibility represents the ability or likelihood of being able to gain that worth ('can I get that pie?'). The factors that are used to assess Opportunity and Feasibility typically need to be customised to context (a revealing and useful process in itself), with the literature providing examples as a starting point for some applications - e.g. near market commercial projects (Mitchell et al., 2014), vs early stage technological innovation. A 2018 working paper describes the project selection approach, which includes some novel features: treatment of uncertainty as ranges on all factors, with the min-min and max-max plotted on the chart (risk that is not associated with these uncertainties is treated separately - listed, with mitigation actions); and the use of scaling statements for assessing the merits of projects, which eliminates the need for (sometimes arbitrary) weightings. The OxF matrix is the core tool of this type in the toolkit platform, with many other 2x2 matrices falling into place around it, in a kind of decision-making 'filter stack'. For example, the Ansoff matrix can be used to 'pre-condition' project types - to separate them out into different types in terms of the degree of innovation involved (as strategic 'buckets'). This is important, as the criteria for selection will typically be different, and an appropriate configuration of the OxF matrix (and process) would be needed for each. After projects have been prioritised, other decision factors bcome relevant, such as portfolio 'balance' (or rather, tension / trade-offs), make vs buy, and so on, where other 2x2 decision-support matrices are helpful. The data relationships between portfolio matrices and roadmaps are not as clear-cut as with the linking grid tool, and in general these two tools are not used closely together in corporations for various reasons. One example from Lucent Technologies in the 1990s provides an alignment clue (Albright and Kappel, 2003), where they show a roadmap with two columns inserted to the right with data from a portfolio 2x2 (competitiveness vs importance, often associated with make-buy decisions). Linking common data sources / structures / elements to the architecture of the roadmap ensures that both tools work in harmony, and scale together, along with the linking grids. As elaborated here, a key feature of the time- and systems-based roadmapping architectural framework is its holistic and flexible structure, and its integrative abilities. As such it forms the natural central hub for strategy and innovation management toolkits, with scalability enabling the same generic toolset to be used at different levels of hierarchy - for example, to develop coherent strategy at corporate, business unit and product levels, and to add other tools as required in a modular fashion, as illustrated below. Many of these other tools are essentially variants of the more general forms established, with a degree of coherence emerging with regard to the plethora of available tools, which can be deployed via these general forms. So, with three generic tools you can get quite far with most strategic challenges. Even with these three tools, at two levels (so that a portfolio view can be established), there are many possible ways to combine them. Adding more tools increases complexity exponentially, becoming rapidly unmanageable. The vision is for a compact general purpose adjustable visual toolkit, that with proficiency in its configuration can provide the basis for coherent strategic technology and innovation management support. A lean / agile 'fast-start' approach is recommended initially, regardless of the size of the apparent challenge when implementing new tools, with early iterations helping with scoping and design, as a learning process. The process and system can be scaled up as it demonstrates value. A set of experimental templates is available here, which illustrate how the three core tools align ('STIM toolkit'). This slideshow demonstrates how three generic tools can combine at two levels to create a scalable toolkit platform, focusing on the simple 'pencil case'. Firstly, consider linking grids, which can be easily integrated with roadmaps if the same underlying architecture is used for both, so that they scale perfectly together. The core linking grids (which can be extended) ensure that the relationships between the layers of the roadmap are clear, with the three broad why-what-how layers of the general roadmap structure associated with two interlinked grids. Focusing on the two core interlinked grids, sub-structure needs to be defined in terms of rows and columns of the grids, which correspond directly to sub-layers of the roadmap. At the 'option level' (one product of a business - e.g. a pencil), customer needs might include the need to write (communicate), aesthetic desires and status, with business needs of growth and capability development ('why'). The functionality and performance of the product itself includes marking, ergonomics and decoration, with business metrics relating to quality and delivery, for example ('what'). Technology and competences such as materials, manufacturing processes and logistics will be important, along with ICT infrastructure and supplier relationships ('how'). At the portfolio (business) level, a company that produces pencils might also be interested in other writing-related products, for example pens or even electronic styluses. The same generic linking grid tool applies here, but with a different structure (rows and columns, relating to roadmap layers at the portfolio level). For example, customer segments, competitors and business strategy ('why'), product categories (pencil, pen, stylus) and services ('what') and technology platforms and resources ('how'). In terms of the roadmap, the same structure is used for this and the core associated linking grids, shown here at the option level (for the pencil), which would allow the strategy for the pencil to be laid out, with separate roadmaps for other products, such as pens and styluses. At the portfolio level, the overall strategy can be depicted on one roadmap, showing how pencils, pens and styluses are expected to develop, highlighting synergies or dependences between theses. 2x2 type matrices are very helpful for prioritisation - for example, should the company focus on pencils, pens or styluses? At the portfolio level these different options can be compared and contrasted, supporting decision making. At the option level it is possible to distinguish between different choices of pen, pencil or stylus. However, it is unlikely that exactly the same criteria will apply to these different product categories, and so they should not be combined into one analysis as shown here - don't mix apples & oranges. A top-down approach is in general sensible, with the overall strategy defined at the portfolio level, feeding into more detailed analysis within each product class. Three tools at two levels provides a reasonably holistic integrated toolkit platform, with the potential to add additional tools as required (e.g. scenario planning or make vs buy). However, there are many ways in which these tools can be combined and configured, which is both a strength (flexibility) and challenge (some skill and experience is needed, although risks can be managed by adopting an agile, interactive approach, piloting, refining and derisking the approach). ... and the T-Plan approach is shown here. S-Plan and T-Plan are two stable references processes, which are useful starting points, but should not be considered static or prescriptive. When viewed through the lens of the scalable toolkit platform it's clear there may be many more plausible toolkit configurations, and a wider solution space is available to the skilled practitioner. Catalogue of ‘matrix’ tools of the 2x2 and ‘grid’ type from the University of Cambridge, Institute for Manufacturing, Centre for Technology Management. Catalogue of decision support tools from the University of Cambridge, Institute for Manufacturing. 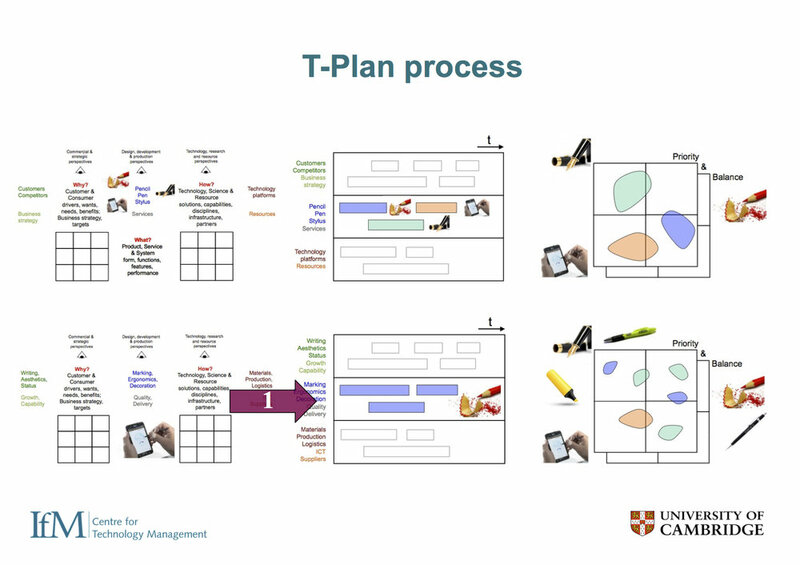 Set of design management tools and techniques collated by the University of Cambridge, Institute for Manufacturing, Design Research Group. Compendium of tools and resource links from the OECDF Observatory of Public Sector Innovation (OPSI). Human-centred Design Kit from IDEO. New Product Development Body of Knowledge from NPD Solutions. Management methods, models and theories relating to ‘value based management’. Continuous process improvement tool catalogue. ‘Periodic Table’ of visualisation methods.